Winter is in the rear-view mirror, so it’s full steam ahead into spring with BitStarz latest all-action promotion. In Spring Break Cancun, we’re bringing you fun, sun, and some serious firepower. Our latest adventure sends you across mountains, rivers, and waterfalls on the quest for €50,000 and a luxury trip for two to Cancun – are you ready to party, BitStarz style? We know what our players like – we are the only two-time AskGamblers Awards winner after all – so our famous €50,000 individual prize pools are back. Featuring 40 fun-filled levels, what’s waiting at every turn of Spring Break Cancun is real cash… and plenty of it. That’s by no means all, as the top prize in Spring Break Cancun will have you soaking up the sun in ultimate luxury. Spring Sun and Cancun Fun! More than 2200 games, 10 minute or less cashouts, no withdrawal limits, 24/7 customer support, and the most super-powered promotions you’ll find anywhere – BitStarz is certainly the biggest Bitcoin casino on the block. 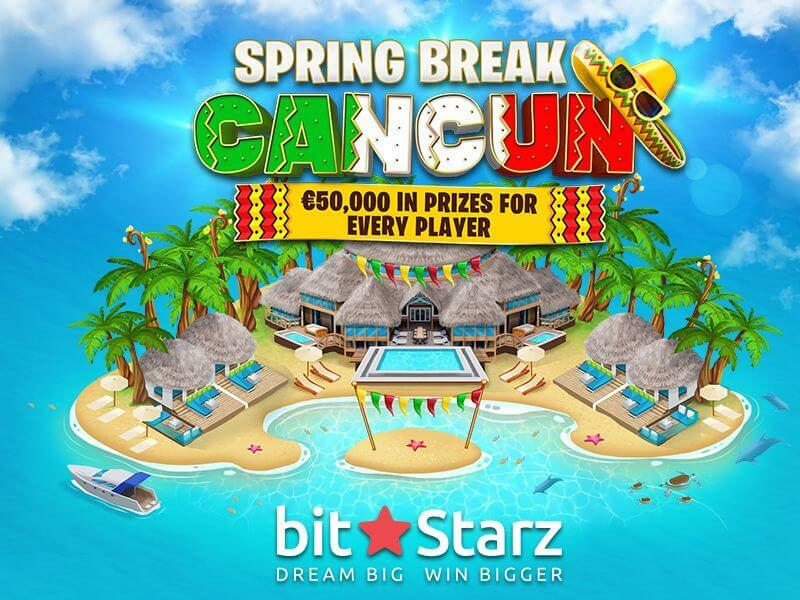 Spring is in full swing at BitStarz right now, as Spring Break Cancun has the power to put you on the plane to Mexico with plenty of money in your pocket. If you’re already a BitStarz member you’re automatically entered, so play today to start making your way through the levels. Not a BitStarz member yet? What are you waiting for? There has never been a better time to join, as the high roller mecca now has one of the biggest welcome bonuses EVER. All new players can grab up to 5 BTC and 180 free spins, if Spring Break Cancun wasn’t enough to tempt you in, this surely seals the deal!